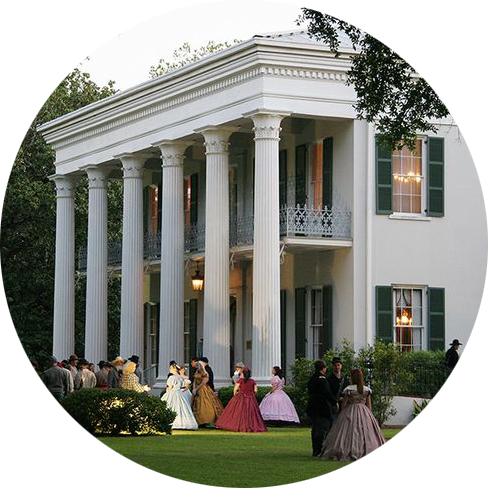 Visit one of the South’s best and most beautiful examples of a Greek revival antebellum home. Due to circumstances beyond the Battle of Selma Committee’s control. Ball tickets are no longer for sale, but registered re-enactors and April 1865 Society, Inc. members may attend in period dress. Become a member of the April 1865 Society Today. NO BALL TICKETS WILL BE SOLD – In the past Sturdivant Hall sold tickets to the Ball to allow non-re-enactor guests, in period dress to attend the Ball. Sturdivant Hall Board decided 2013 not to sell these tickets. MEMBERSHIP MAY ATTEND AT NO CHARGE – All members of the April 1865 Society, Inc , in good standing, may attend the ‘Ball’ at no extra charge. There will be a membership list at the door. The member must be on it to enter. PERIOD EVENT PARTICIPANTS will be required to present the Ball Pass given them at registration. Please ensure you have your Ball Pass when you arrive at Sturdivant Hall. COMMEMORATIVE GLASS – Society Members will also receive a commemorative glass at no charge if they visit the hospitality table. A single one year membership is $20. 2. We have a Family Membership ($35), who may attend? A Family Membership would cover the entrance of everyone in that family that currently lives in that household. For administrative purposes all attendees covered by the Family Membership should arrive together. 3. I am a current Patron Member, may I bring anyone else? Patron Members may bring an additional four guest of their choice. For administrative purposes, all attendees covered by the Patron Membership should arrive together. 4. Where do I get ‘civilian period dress’? -There are Sulters at the Battle Re-enactment and on-line that sell quality period dress. This is the preferred way. -Gentlemen may wear ‘Tails’ or ‘Morning Coats’ as an alternative ( please no modern tux). Active Military personnel may wear active duty Dress Uniforms. -There are costume rental companies on-line. 5. I have a Family Membership and my 13 year old daughter wants to attend in ‘civilian period dress’, may she come alone? Absolutely not. Children under the age of fourteen must be accompanied by a parent or guardian in ‘civilian period dress’. 6. Where can I get a membership form? You may download a membership form by clicking here. Ball admission requires “Period Dress”! All Gentlemen shall wear coats regardless of age.